Hot on the heels of the third year students' graduation, μ's is invited to New York in hopes of spreading the joy of school idols to other parts of the world. Due to the events of the recent Love Live!, μ's has reached eminent stardom which results in crowds swarming them whenever they appear in public. With the increased attention, however, comes a difficult choice. Having yet to publicly announce the decision they came to regarding their future, the young members of μ's are pushed to continue performing by rival group A-RISE, Otonokizaka High School, and even Love Live! itself. As leader, Honoka Kousaka is left wondering if the path they have chosen is truly for the best, as μ's must re-evaluate their choices and come to a final decision on what they want for the future. Love Live! 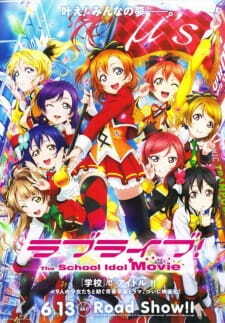 The School Idol Movie depicts the final chapter in μ's story as the girls explore just what being an idol means to them as well as the bond that connects the nine of them together. Love Live! The School Idol Movie ended its 202-day theatrical run in Japan on December 31, 2015. During that time, it earned 2.86 billion yen in the Japanese box office. The movie was nominated for the Animation of the Year award at the 39th Japan Academy Prize. Having put Love Live's final adventure off for weeks after weeks, afraid of meeting the end of the series, now, after finally gathering the courage to watch it, I am left with the thought that Love Live may be the best idol series created. It's surprising how far the series has come over the past couple years. I'm not sure most people thought much about it when the first season aired, other than that it was your typical idol show with some cute girls and some cool tunes. But after the airing of the excellent second season, and now with the movie finally cementing what it is that makes the series so special for so many people, Love Live has established itself as one of the most significant series in the anime industry and present-day Japanese culture. It would be foolish to claim that all Love Live has going for it is its popularity, however. It succeeds at being more than just a fun little idol show. Even if it may have a few minor issues, as all anime do, and even with the large layer of cheese surrounding some of its dialogue, Love Live is a truly heart-warming and excellently crafted anime, and I am very sad to see it end. Love Live's movie is similar to the K-ON movie in many ways, particularly in its structure, as the trip to New York represents only a portion of the film's screen time. And, really, it is for the better that way. If all we saw were the girls of Muse having fun and singing around in New York City, it's likely it would feel like a mere spin-off rather than a meaningful advancement in the story and the characterisation. Love Live does advance the story-- it does give you something to care about, as it is not only an end for the girls, but also for the fans, as it is unlikely we will ever see anything involving these characters again, at least in the animated form. And that's hard to accept at times; there was a sinking feeling in my stomach that I don't often get from watching anime. But this is the way it should be. I'd be more than happy to see the girls continue their idol activities past high school, but it was the right time for this chapter to end. It is an ending I can be satisfied with, even if I do not want it to be over. And I don't. While the TV series had a couple characters I wasn't too big on (particularly Nozomi), none of them felt bothersome or out-of-place here. They have all done enough to earn their place... though, certainly, I would not complain if my Nico were to hog all the screen-time instead. It was somewhat difficult to pay attention to what was going on since I would often start laughing like a crazy person whenever Nico appeared. I hadn't seen my glorious Nico in animated form for a year and a half, so it could not be helped. I was also a bit surprised at how damn adorable Kotori was; it appears I may have been blind and deaf when I was watching the TV series. A great job is done at making New York City feel alive and bustling, with real locations modeled upon and with random pedestrians occasionally having their say. Seeing Honoka and the rest fumble around with their terrible English (ekkusukuzu mii!) in a futile attempt to communicate with Americans, is, unsurprisingly, pretty hilarious. By the way, I have no idea how the hell that one girl knew they were Japanese at first sight. Even I, having seen a whole heck of a lot of Asians in my lifetime, have some difficulty immediately telling a Japanese person apart from, say, a Chinese one. I'll just assume Random Blonde Lady is smarter than me! It seems Love Live likes to experiment with the idea of being a musical, too, since the characters will sometimes bust out their dance moves all impromptu in the middle of the city, random Americans joining and signing along and all. It certainly adds some... uh, life and energy to the story, even if I would personally prefer they find a less silly reason to showcases their vocals. Love Live is obviously not aiming to be a perfect representation of reality, and that's just fine. Who needs reality, anyway? The dialogue can occasionally be a bit cheesy (Honoka hopping and twirling around at the end, claiming she "can fly! ", yay! ), but this isn't nearly frequent enough to be a big deal. If anything, it'll just make you laugh a little bit. I don't expect all scenes to be perfectly mature and believable, because Love Live is a big series with big appeal, especially for young girls who normally enjoy that sort of thing. I don't feel comfortable taking that away from them. Love Live is fine as it is. The songs are great and their performances well-coordinated (particularly at the very end with Nic-- with Muse dancing and tapping their feet along), but my one complaint is that the movie still uses some CG during these scenes. The CG doesn't look bad, not by any means, nor does it feel out-of-place (especially when compared with rival shows such as Aikatsu), but certainly it would have been nice if fluid 2D animation were used all the time instead, rather than most of the time. The animators could have gone all-out here, but they chose not to, presumably because of deadlines and other business-y things. Instead the movie looks merely good, rather than fantastic, which is something I'm still pretty OK with. It is also worth noting that, unlike a majority of anime, Love Live actually knows how to time its background music in a way that feels appropriate - sentimental yet not melodramatic. It doesn't go overboard, but it does still make an effort, hitting the key moments of the track as it pans over the girls sitting and pondering their future in the club room, rather than screaming at the top of their lungs as most anime characters apparently have a fixation with. I don't think most people will tear up during these scenes, but it is quite hard not to have at least some sort of emotional reaction. Love Live knows knows how to convey emotion to its audience when it wants to. There are also a few subtle visual tricks that add to the cinematic feel, like a young Honoka jumping before immediately cutting to present-day Honoka's foot slamming off the ground. These aren't details that are likely to cross your mind as you watch, but they do add up and give the experience more of an impact and a punch. It's clear the animators wanted to set the series off on a grander stage than it started on. The Love Live movie is a hell of a time, and is easily the most fun I have had with an anime since Shirobako finished airing. I came in expecting nothing more than to see more of my Nico doing her thing and being the beautiful lady that she is, and while there certainly was a decent amount of that, there's far more here, too. Love Live wanted to end on a happy note rather than a sad one, and it did a fantastic job at doing so. I've had a lot of fun with you, Love Live, and while I don't know if I can let go, I can at least say goodbye. I had the pleasure of watching this in theaters in Japan, and the movie is just what you would expect a Love Live! film to be: 1/3 music and dancing, 1/3 anime girls doing cute/funny things, and 1/3 drama - an animated musical comedy. If you already watched the first 2 seasons of the show, you know exactly what you are getting yourself into. However, there is one huge difference between the movie and the show: the first half takes place in NEW YORK CITY. As a New Yorker, it was an absolute joy watching my favorite group of animated girls take on the great metropolis on the other side of the world. It also had great insight into how Japanese people think of the United States. As someone who lives in NYC, I don't fully appreciate the city, but from the perspective of Japanese high school girls, it must be a helluva place. It is also clear that the art crew for the movie did their research and location scouting in NYC, because a lot of the spots featured throughout the film are locations I walked through just last week (although it's also clear that they probably didn't interact much with real New Yorkers; the NYers featured in the film are WAY too nice and well-mannered haha). The story for the Love Live! anime has never been any more than a means to get the girls dancing and singing, and the movie's no different in this regard. Basically, the plot is very simple: the girls have been invited to perform a live concert in New York City (the first half of the movie), and after they get back to Japan, they are surprised to find out that their overseas stint has earned them fame back home (second half of the movie). There is some drama involved regarding the third years graduating and whether to continue the group, but it's basically the same main conflict as the second season of the TV anime. Once the group gets back to Japan, it's the usual stuff we've already seen before. The plot is pretty bare-bones, and since this movie is almost 2 hours long, there were definitely parts of the film that felt dragged out. Some of the songs and dance sequences also came out of nowhere with little segue, like some sort of Broadway musical. Overall, I'd have to say the story was the weak point of the film. The animation is almost the same as from the show, and all the characters' movements and features are beautifully animated. The musical dancing scenes are especially well-done, although I'm not a big fan of the CGI concerts (this film has 3 of those, and 3 purely 2D ones). One place the movie surpasses the show is the backgrounds. As I said before, the backgrounds for New York are meticulous and surprisingly accurate. The Akihabara backgrounds are quite detailed as well. It was quite amusing looking at all the brand parodies in the background in the film's attempt to avoid a copyright lawsuit. Overall, solid art and animation, slight but not major improvement over the show. All the characters' voices are on point as usual. It was quite amusing listening to Honoka and Nozomi trying to speak English in NYC. To the film's credit, they actually got legit English speakers to voice the New Yorkers in the movie, so the film remains MOSTLY Engrish-free. The songs are the catchy tunes we've come to expect, and pair off really well with the dance sequences. However, I will say that the 6 songs featured in the film are not the series' strongest ones (my personal opinion is that the group's best song was the opening from season 1). They are quite good, but not good enough to put on my iPod. All the characters we know and love are back, a mysterious new character comes into the mix, and a new generation of school idols are hinted at towards the end of the film. But there is one HUGE problem. It's no secret that Honoka is the least popular of the 9 girls, and after watching this film, I think I know why: the film spends WAY too much running time trying to develop Honoka's character and her inner struggles as the team leader. It would be fine if it's an episode of the show, but in a 2-hour film like this, the result is that screen time is taken from the other girls who are just as, if not more, interesting in terms of talent and personality as Honoka. By the end of the film, I wished there was less Honoka, and more of the other girls. Not a problem with Honoka's character herself, but more with the direction of the movie. Despite some of the flaws I listed above, the film was overall wholly enjoyable. A great way to spend 2 hours sitting back and enjoying some great music and dancing, funny antics, and cute girls doing cute things. What more could an anime fan ask for? If you enjoyed the first 2 seasons of the show, then you are sure to enjoy this movie as well. When I started to watch Love Live!, I was extremely skeptical of how the plot would play out. I'm not really into the whole idol culture but I wanted to keep my mind open and give Love Live! a shot. And boy am I glad I did. Now I can at least appreciate what idols have to undergo. The movie, which builds off plot-wise immediately after the second season, uses the same kind of group dynamic that was present in the second season. Although this form of group dynamic doesn't change much from the second season (or ever, lol) you could almost feel the charisma beaming from the group. The characters, despite the fact that their personalities are clearly drawn from stereotypes/archetypes, clearly mesh together very, very well. They complement each other and this is reflected through their dialogues and reactions. As for the sound, well, this should be pretty self-explanatory. What would a music-themed anime be without, well, music? One interesting thing that this movie does differently from the prequels is that there is a much heavier emphasis on the sound. In the previous two seasons, the songs were still there (and done very well, if I may say so myself) but they served more to advance the plot as a whole. In the movie - for a lack of a better phrase - the μ's break out into song based on the situational context that they are in. Basically, think High School Musical all over again. Is this done well? I think so - it certainly adds new flavor to the entire series, but that is my own personal opinion. Now for the cons. Bear with me for a bit. The plot itself had a rougher execution than the second season. There were some parts in the movie where the plot was rushed to some degree. For example, consider the transitioning scenes from New York (where they are at Times Square) back to Japan (where they are meeting fans at the airport). To me, these scenes were kind of thrown together into an incoherent mess. Although you could tell what was happening at any given moment, sometimes the plot jumped from Point A to Point B inconsistently. These scenes needed to be flushed out more so that viewers can more easily comprehend what is happening. Another thing I didn't really like was how the movie was piecemealed into two parts - one part in NY and the other back in Japan. The connection between these two parts of the movie needed to be more clearly established. True, perhaps their trip to NY served as inspiration to the Idol festival in Japan, but this was not really flushed out well. If the movie left out the entire adventure in NY, could the rest of the plot been executed in the same way? Perhaps. Maybe some of us wouldn't like that, but it's still possible. One last thing: the symbolism. Okay, I know this movie tries really hard to integrate some kind of deep symbolism that was not present in the first two seasons of Love Live! But if you're like me, just an average anime watcher, the symbolism completely flies right past you (e.g. the street singer in NY). Symbols don't necessarily have to be obvious, but they should be incorporated into the plot in a way that still makes sense. But kudos for trying. Overall, definitely a nice way to end Love Live! But is it on par with the second season? I argue not. I've talked about the first two series of Love Live. In both cases the results were fairly positive and I rather enjoyed the experience. I'm sure some of you are thinking, "but you're literally the biggest killjoy in existence, you aren't allowed to like things." I'm sorry, but that accusation is still hilarious to me. Putting that aside, the second series of Love Live ended with Hanayo getting a message and running off excitedly, followed by the other members of μ's. This film, released last year, follows that plot thread. So, does it lead somewhere interesting or will this be a waste of our time? Let's look. We open with the members of μ's learning that the next love live competition is going to have a larger venue than any before. With plans for it to be held at the Akiba Dome. In order to make those plans come to fruition, they're asked to go overseas as the winners of the last competition and gather interest. In the process, they find themselves riding a sudden wave of popularity, forcing them to question whether they really want to disband. The biggest weakness of the film is that a lot of the main conflict is based on retreading through the ending of the second series and the questions the girls have to ask themselves do lose some of their impact. That being said, overall, the film works quite well. The pacing is well done. The charm and fun of the series are very much present. Even the retreading does kind of work, given that there's a strong impetus for them to have second thoughts. The cast doesn't develop all that much beyond where they were in the series proper. Which makes some sense, given that the film takes place directly after. The film's strong suit lies in taking these familiar characters and putting them in a new situation. Which allows some new facets to emerge for their characters and enables some strong interactions among them. The artwork looks a lot like the artwork from the series.Which isn't a bad thing by any stretch. the dancing and musical numbers are vibrant, interesting and very nicely done. The characters look good, particularly when it comes to their costuming, and the backgrounds are nicely detailed. I can't complain about the sound. The cast is made up of excellent singers who are also strong actresses. The sound track is as magnificent as you'd expect based on the series. The film doesn't include les-yay to the extent that the series does, probably because they don't have as much time. However, they still have a good amount. Hanayo & Rin get a romantic moment. Niko gets seemingly jealous over seeing Maki act close to another girl. Niko, Honoka & Eri share a bed in the Honeymoon suite and there's just a lot of general intimacy among the girls. Love Live: The School Idol Film is about what you'd expect. It's a charming film with endearing characters, superb acting and music and ample amounts of les-yay. I would say that it's well worth the watch. As such my final rating is going to be an 8/10. Tomorrow, I'll look at something where I don't have a good idea of what I can expect. I'll be looking at Magic Tree House. June marks the beginning of summer and to celebrate we are revealing Right Stuf’s Top 15 best-selling anime titles for the month. From hot new releases to anime classics, this list has a little bit of everything. Will your favorite titles make the Top 15? The School Idol Project may be the one thing to stop the beloved Otonokizaka High School from closing - but is its success down to the guiding hand of Nozomi Toujou and the wisdom of her tarot cards?